As I predicted in March, the media feeding frenzy over public sector pay and expenses is heading for the NHS. This weekend the Sunday Times, desperately trying to find a new angle on the MPs’ expenses scandal, has been targeting “council chiefs and quangocrats”, including Bill Moyes, executive chairman of foundation trust regulator Monitor. The heady mix of expenses stories in the media is blurring important distinctions. Buying yourself a state of the art plasma screen television at the taxpayers’ expense is enrichment; reclaiming reasonable expenses run up while doing your job is not. One of Moyes’ lunches was with me; while I hope he found it a pleasant enough experience I do not feel it constituted a ‘perk’. In light of the MPs’ expenses furore, NHS pressure group Health Emergency has called for the NHS to publish senior executives’ expenses claims over the past five years. Its statement is naked manager-bashing, packed with pejorative drivel such as talk of a “top salaries gravy train” and “grubby corners of NHS executive pay and benefits”. By undermining hard-working staff with these cheap shots, Health Emergency is playing straight into the hands of the TaxPayers’ Alliance, who are hardly great friends of the NHS. 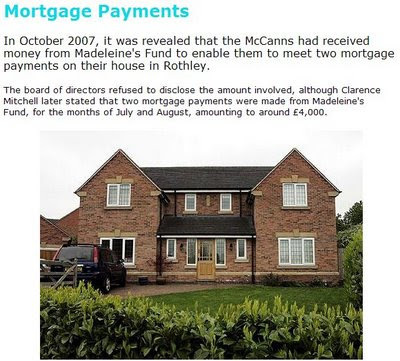 "Maddie Cop in riddle of Bank Account £100K"